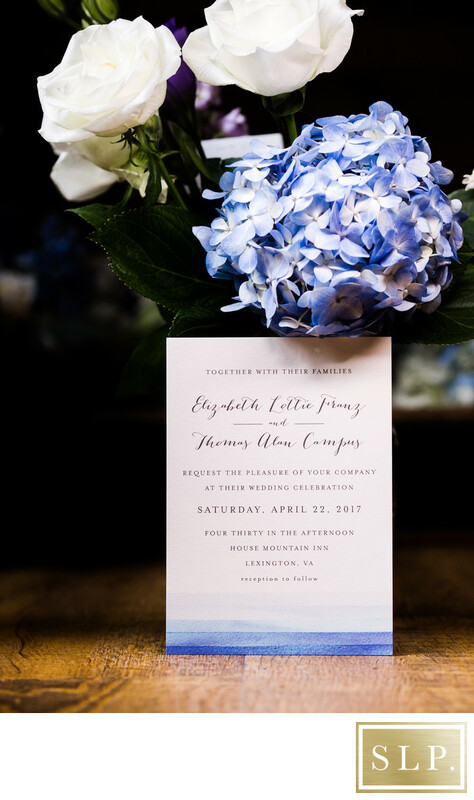 I absolutely loved this gorgeous blue and white watercolor style invitation. It looked so perfect propped up next to the beautiful hydrangea and roses. Perfect for an April wedding at House Mountain Inn. If you have never traveled out to Lexington, Virginia, you are missing out. It is such a beautiful place with lots of hidden gems. House Mountain Inn is a gorgeous venue tucked into the mountains. It offers a lodge style experience and gorgeous views. I have traveled over there for a few weddings and I'm excited to be back there this year. It's a short one hour drive over the mountain from Lynchburg and I am always so happy to be able to photograph weddings here with my couples. Location: 455 Lonesome Dove Tr., Lexington, VA 24450. Keywords: april wedding (3), house mountain inn (3), lexington (3), lynchburg engagement (42), lynchburg virginia (42), Wedding (9).